Flying to Korea is never fun. Our flight there was even less fun. The flight to Seattle was fine, we sat in the exit row, so we had lots of leg room. The landing a little rough, but the airport was nice enough. Our flight to Seoul was long, but fine up until the last bit, when we were delayed from landing due to weather, which caused “airport congestion” which delayed our flight even more. 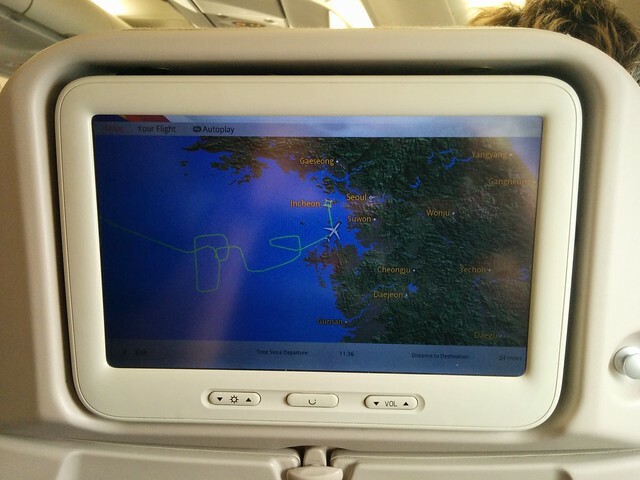 Our plane flew around in circles for an hour waiting to be cleared for landing. Thankfully, the driver for ESWS was waiting for us, and helped us get through the airport and tucked nicely into our room. The room this time had a twin bed and a double, space for three! Monday morning we woke up early, because JET LAG! 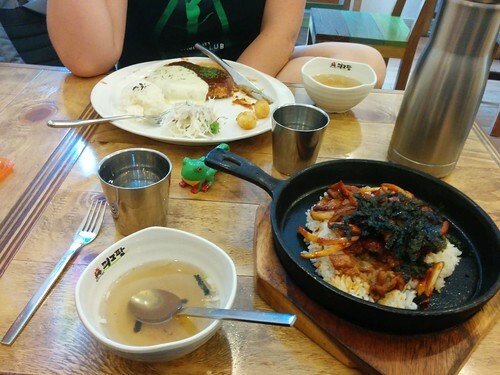 We went down to Seoul Station for breakfast and spent some time walking around, enjoying morning in Korea. We were due to take custody at 11:30AM, so we eventually headed back and changed into nicer clothes for our meeting. We signed papers and got some gifts from ESWS, a “name chop” with her name in Korean and a cast of her feet from when she was about 5 months old. We signed more paperwork! Woo! Then we returned to the lobby to wait. A very long eight minutes later, Eve’s foster mom came in with Eve asleep on her back! Bobby took her off and held her immediately. He played with Evie and kept her happy while Foster Mom and I talked a bit. She showed us a bunch of pictures and gave us a large book filled with them, so we have baby pictures of our girl! She told us that Eve never made her angry, that she was very sweet. She gave us back almost everything we had sent for Eve, toy wise, which was a lot of stuff, along with food, snacks, formula, (Eve takes a bottle at bedtime), motrin, her Hanbok, the outfit she came home from ESWS to Foster Mom’s house in, and so much stuff. We got a list of words Eve can say and what they mean, we talked about her schedule and everything. She gave us a toy keyboard and told us about how Eve loves to play it while Foster Mom sings. Foster Mom was very sad to see her go and cried. We hugged her and promised to take good care of KaYeong. She very obviously loved this little girl very much, and we will be forever in her debt for the care and the love she gave our daughter. Her foster mom is an amazing woman. 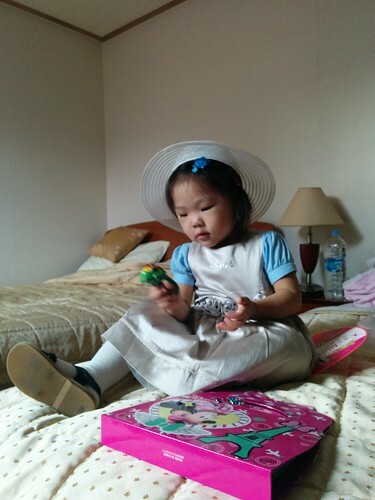 KaYeong was the 36th child she had fostered from babyhood until the child went to the USA. I feel I should note, Eve’s adoptive name will be “Eve KaYeong” and we have been calling her Eve, Evie, and KaYeong, and plan to call her both names, much like we did our boys with their nicknames, (Landon was both Landon and Panda until 1st grade, Oliver is called both Ollie and Oliver) until she is old enough to tell us what she wants to be called. I’m mostly typing Eve for because it’s shorter, but keep in mind we are calling her KaYeong more than we are calling her Eve. Her foster mom only called her KaYeong, and it is what she responds to currently. Another family, the B family, who we had gone to court with, was also getting their little boy at the same time, and their transition was not as smooth. 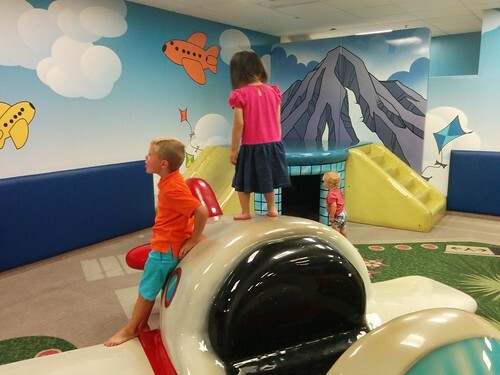 The little boy was crying loudly, so our social worker recommended we take Eve back to our room. We spent about 20 minutes playing in our room before we went back downstairs and loaded up into the van to head to the US Embassy to apply for Eve’s visa. We loaded up in the van with the B family, whose little boy was still having a hard time. Also, carseats? Not a thing in Korea, so my poor american heart was horrified at putting Eve in the seat between us and buckling her with a lap belt! Between little B and the van ride being a New! Scary! 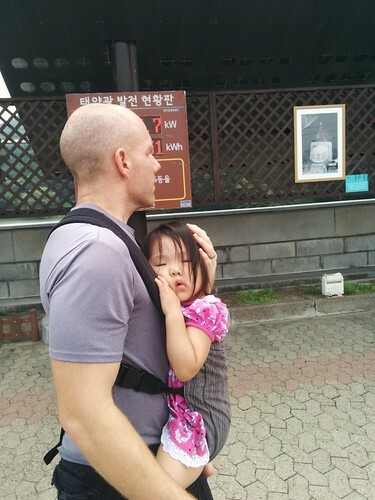 thing, (I don’t think Eve had spent much time in a car before) Eve succumbed to tears as well, so both children were crying for “Omma” by the time we got to the Embassy. They got us in the door and up three flights of stairs fairly quickly, to an empty waiting room. The children sobbed as we waited for processing. I hugged her and sung to her and rocked her. Someone gave her a sucker, and she calmed down while she ate it, but started up again after. This continued for a good 20 minutes, at some point we were called up and asked some questions. Finally we managed to get her calm and coloring, so that was good. Also, they had some kids books, and she loves books, so she pulled some of those. We made a game of getting a tiny cup of water from the cooler and taking it back to the kids desk. Little B sobbed until he ran out steam, than would start up again. Thankfully, they rushed us through, and we got out of the office after about an hour. The same van took us home, and Eve fell asleep on the way back. We took her up to our room and she took a nap. 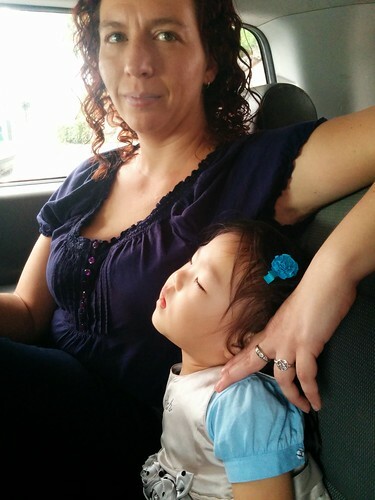 We were sort of wiped out after that, but once she was up we went out and got some fried chicken for dinner. I fed Eve the meal her foster mom had prepared for her. It was highly entertaining. I set out in front of her a cup of water, a cube of veggies, a cube of rice, and a juice box. I was feeding her, even though her file says she can self feed. It’s good for bonding and it helped me ensure we were getting food into her. So, I’d give her a bite, wait for her to chew, and then ask her which one she wanted, and I’d point to them and name them. She’d then give me a funny look, and point to them and name them in Korean. She seemed to take personal offense at the fact that I was calling the grape juice something other than Podo. 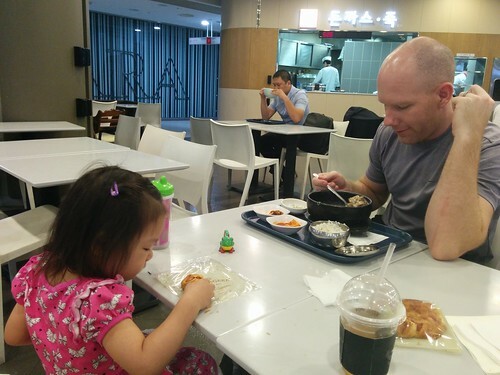 She’d patiently tell me the names of the food in Korean. Also, she liked the veggies best. That night, we put Eve and I in the double bed and Bobby slept on the twin. Eve had been cosleeping with her foster mom for almost her entire life, and we worried she’d roll off the small bed by herself. She slept through the night without issue, sleeping long past when Bobby and I were both awake. Breakfast the following morning was doughnuts for Bobby and I, but Eve got to sit and eat an omelette thing that her foster mom had made her. She told us the egg was Eve’s favorite food, and Eve ate the whole thing. There were a couple of other families in the kitchen at ESWS, so our first breakfast was shared by others who understood, and it was such a blessing. Eventually we got moving and took the subway to Seoul Zoo. We had her in her baby carrier (the cinchworm that we used to carry Ollie) and she seemed to enjoy it. Once we got to the zoo, we put her down and rented a stroller, in part because it was so hot! The zoo has a lot of land space between animals, and it’s very pretty, but a lot of outdoor walking. 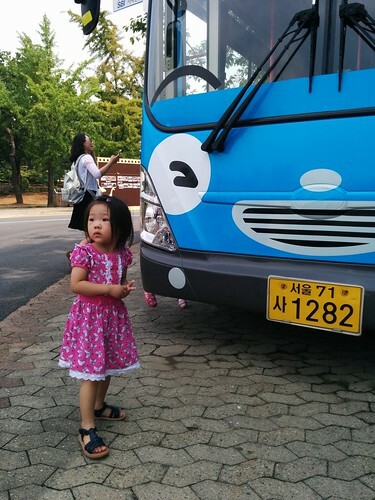 When we first put her down, she suddenly got very excited and dragged us over to see a big blue bus! It was apparently painted to look like Tayo. 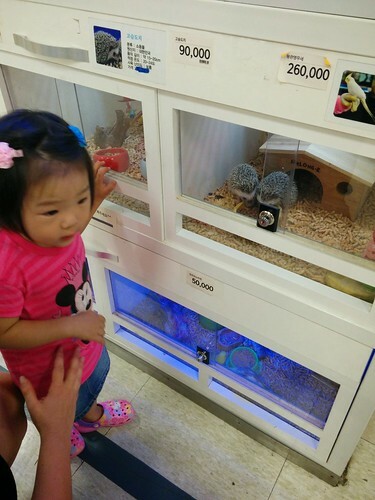 She also loved looking at the animals and kept trying to climb in the cages with them! We only had one pair of shoes for her, and she didn’t seem to like them much. She kept taking them off. Bare feet seems to be frowned upon. We saw some animals and got some pictures, and Bobby posted a video of us at the zoo. Once we were done we headed back to the subway, and stopped in Seoul Station to buy Eve some new shoes, since she wouldn’t leave the old ones on. We went back to our room, and Bobby fetched us a pizza. Eve had no interest in the pizza, so we fed her the last of the food foster mom had packed. She slept again without issue, in bed next to me. 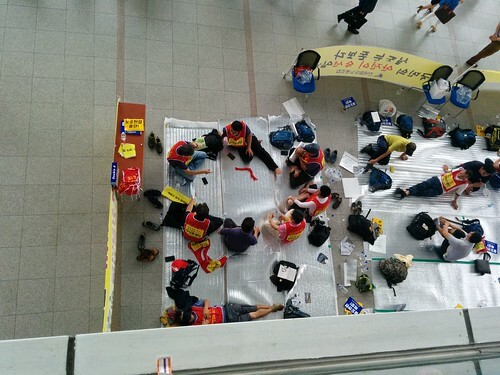 When we woke we headed into our favorite nexus, Seoul Station. There was some sort of railroad worker strike going on, which was interesting. The signage and everything was in Korean, so I’m not sure the details. We split up, Bobby hitting the food court for some sort of Ox soup, while I had some french pastries. Eve stole mine, which was adorable. We went back to iPark Mall after that, Bobby and I had been there on the first day we were in Seoul on the first trip. 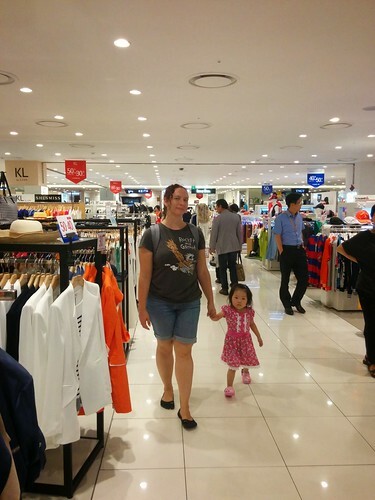 We did some shopping, getting Eve her third pair of shoes, some Pororo toys, and stickers. Just a few things to entertain her on the flight. We ate at the same place we had lunch the first time we were at the mall, and it was super tasty again. Eve seemed to enjoy the food as well. Finally we headed back to pack up and fly home. At the airport, we discovered we were not sitting together. We tried to change seats, but with a language barrier, we weren’t able too. So Bobby sat six rows away from Eve and I. On the bright side, we had an aisle and window seat for Eve and I, so no one was sitting near us. She watched some Pororo and fell asleep. 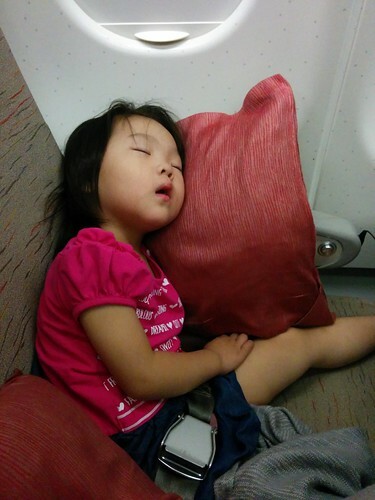 She slept for most of the flight, waking up on occasion. Bobby would come up from the back a couple of times and sat by her so I could get up and stretch and hit the bathroom. We were late getting into Seattle because they had held our plane in Seoul due to waiting on some first class passengers with a late connecting flight, so arrived into some sort of rush hour madness. The line to get into the country was rather long, especially for new immigrants. We went into the line for people with US passports and then got escorted over to another waiting area so that Eve’s paperwork could be completed. It wasn’t terrible, just a lot of people. Getting our luggage was terrible though, so many people fighting their way through, and then we got to go through security a second time as well. There was this water bottle graveyard in front of security, just hundreds of abandoned water bottles, like some sort of monument to the stupidity of our security. Anyway, the flight home was only a few minutes late taking off, and we were at the very back of the plane. 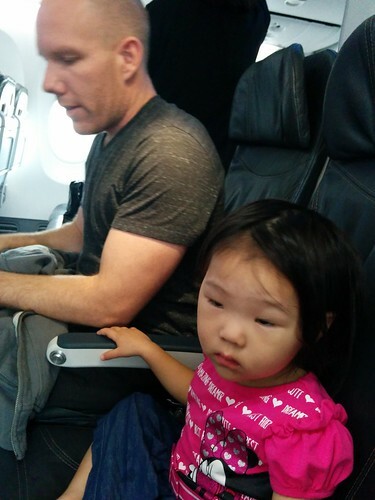 Thankfully, we’d worn Eve out in Seattle, so she slept most of the way home. I dozed for about a half hour, and then watched some TV. My Kindle Fire has been most handy for plane flights. Grandma and Aunt Heather picked us up at Terminal 2, and we grabbed our luggage and went out to the car. There, we strapped Eve into her carseat for the first time. She was confused by this, and when I closed the door to go around to my side, she FREAKED OUT. Just started sobbing for Omma. Poor baby. We got her calm, and made it home around midnight. It had been a very long day. Traveling back in time is hard. She poked around some before we got her into bed. We’re co sleeping for a few weeks. Eve has been doing pretty well overall. She’s had a few times where she asked for her foster mom, and I have been comforting her and telling her “Mama’s here” and that I’ve got her. While in Korea she was very upset if one of us left the room, asking about where we were. Now that we are home, it seems to mostly be me that she looks for. Overall it was a very tiring whirlwind of a trip, but we are so thankful to have our little girl home!